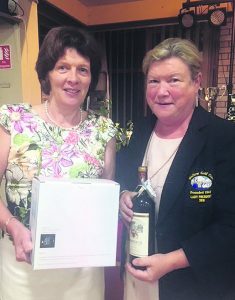 Prizewinner Mary Dowling with President Lily Walsh. Our lovely Lady President Lily Walsh celebrated her Lady President’s prize last week, and, from early morning, well-wishers arrived to add their congratulations and good vibes for the day. All reacted to the fabulous, autumnal-inspired prize table. Everyone had the view that they would welcome any prize on view, such was the array. Lily is nothing if not artistic, and this really showed with the display. Early risers got a clear run with none of the forecasted rain appearing to hamper our attempts at reasonable golf. Overnight rain had, funnily, not drained through so extra concentration was needed to stay down on the bare lie (some, in fairness, more successful than others!). It was an enjoyable morning, nonetheless. The atmosphere, as ever, was good in the club as people lunched (thanks, Dave) following the golf. In these early stages, Claire O’Mahony was happy to feature in longest drive, overtaken by the Lady Vice Captain and subsequently (and not surprisingly) overtaken by tennis supremo and long hitter Ber Clarson. After the golf, everyone gathered in the club for a wonderful night of food, prize-giving and celebration. Lady President Lily has to be delighted with the night which she provided for the ladies’ club. From beginning to end (very late! ), it just worked. Lily’s sisters, family, guests (school friends) and committee did their level best and succeeded to make it a night to remember. People gathered early in the nicely decorated dining room to partake in an excellent, as ever, meal provided by Dave and staff. Melanie, Siobhan, Noreen and Ka joined in the general banter and minded their members well. Susan (baby sister) started proceedings as MC and called on the woman of the evening to say a few words. Lily spoke eloquently, issuing thanks to family, committee, Lady Captain Marcella, Captain John Liston and President Patsy Browne for making her year such a pleasant one. She made particular mention of the President’s wife Helen Browne as well as the three beginner members who attended. Her proudest moment of the year was the incredible success of the ‘Play in Pink’ event which raised €3,000 for Breast Cancer Research, and she thanked all for their contributions to her chosen charity, Arc House. She then called on Helen Browne to say Grace and the festivities began. Dave seems to surpass himself with every event, and the food on the evening had to be seen to be believed. The constant flow of people to obtain seconds bore testament to that. We are lucky in Mallow to have his services. The meal over, we waited in anticipation to hear of the chosen few who would be lucky enough to receive prizes on the night. The prize table had been transported from upstairs to down, and lost none of its splendour in the process. Rumours abounded of 38s and 39s in difficult conditions, the afternoon people feeling a bit aggrieved that they had to play in the rain! 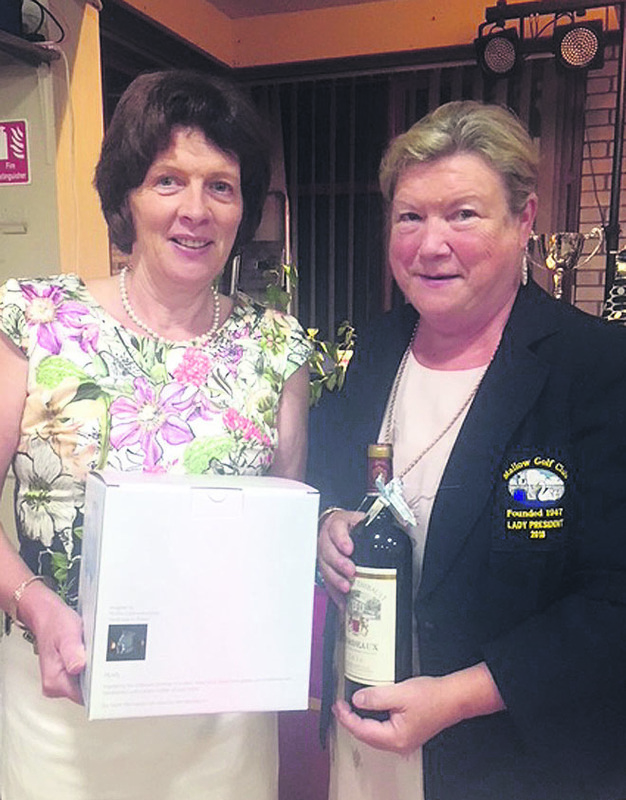 Pauline Hegarty emerged as a very popular winner with a steady 39 points. The fact that she had never won a Captains or President’s Prize made it all the more pleasurable. The tables were cleared, the music arrived and what followed was one of those nights that makes Mallow Golf Club what it is. The dance floor heaved with members making shapes (of all sorts), and the ladies were joined by many members of the men’s club who arrived to pay tribute to Lady President Lily. A night to remember and to treasure. Well done, Lily.